Hello wall of cheese! I hope most of you are lucky enough to live near a Trader Joe’s – I can hardly contain myself that one is actually opening in walking distance from my house! For anyone who has survived a Trader Joe’s parking lot then you know how amazing that is. The reason those parking garages are like the Hunger Games is that once you get hooked on Trader Joe’s you just want more. I will admit that it is not the best store for everything – the produce can be iffy, same with the meat selection and you won’t be finding rolls of Bounty or boxes of Lucky Charms here. However, for life’s important things – cheese, wine, croissants and fresh flowers – TJ’s is the best. Shopping there can be a bit overwhelming, especially at peak times, so it’s easy to pass right by terrific items if you don’t know what to look for. I have seen a couple articles on the best TJ items, all which left out some of my favorites and then my dad introduced me to their chocolate croissants which I had been missing for years! Clearly it was time to share A Capitol Contessa’s Best of TJ’s to hopefully help you get out of there with all your limbs attached and a cart full of goodies. Starting here since they are usually right by the door. I love having fresh cut flowers in my house especially when it starts to get cold and nasty out but it’s an expensive habit. TJ’s doesn’t have the biggest selection but the quality is good and the prices cannot be beat. I like to grab a couple bunches of a single flower so it looks really bountiful – I will usually go with the alstroemeria (also known as Peruvian lilies), roses, tulips or hydrangeas. If you like a little more variety they have mixed bouquets as well. Grab some flowers and add them to your cart and they will bring a sense of clam as you enter the breach. As I mentioned, this is certainly not TJ’s strong point. I have often found a giant pile of avocados just to discover that every single one is almost liquid inside. Same for pre-washed lettuce – just don’t, the odds are about 99% that once you get home it will already be rotten. However, there are a couple of notable high points where TJ’s gets it better than most grocery stores. Jalapenos for instance, TJ’s sells them in plastic clamshell boxes so you get about a dozen or so and they are big, spicy and are always in good shape. 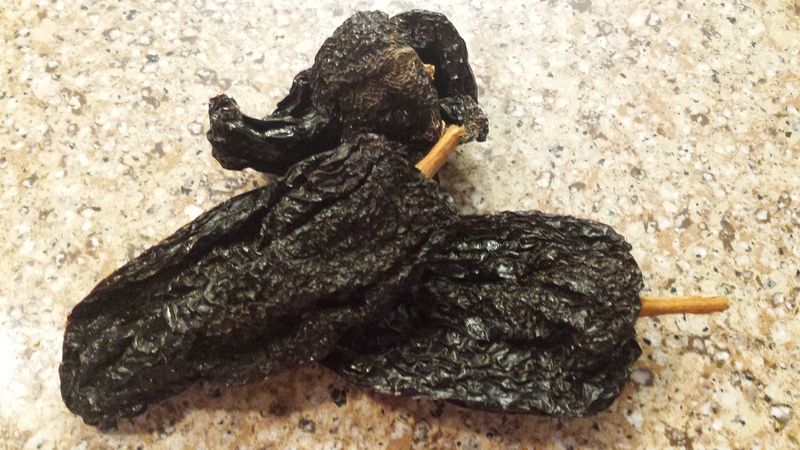 Perfect for making jalapeno chips. Also terrific (random I know) are their bags of green scallions. 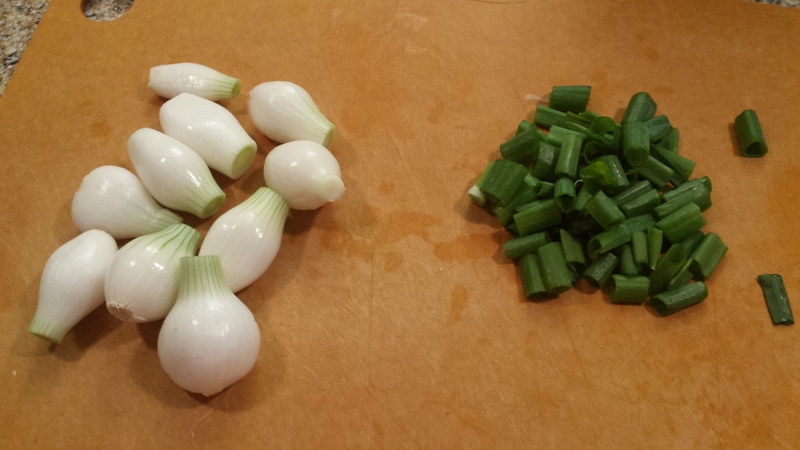 I find that even in the best grocery stores often green onions are tiny, or totally limp, or half rotten. The ones at Trader Joe’s are really good and keep for a while in the bag (pro tip – add a paper towel to the inside of that bag before you put it back in the fridge and they will last even longer). You can sometimes get lucky with other fruits, veggies etc but these are the two that really stand out to me. I am going to skip the meat section entirely because unless you are in a pinch and just need to grab chicken breasts there is really nothing to recommend there. I have never had a hummus from Trader Joe’s that I didn’t enjoy, and look at all the different varieties they have! Great for taking into work as a snack (and yes they sell snack size too), their dips are also great for parties. If you are hosting a ton of people grab their white bean spread or spicy hummus and just keep them in your fridge for back up. Also delicious their fresh pastas that can be found right next to the hummus. Don’t skip the Chicken Pot Pie Ravioli. Now we are about to get serious. If you go into Trader Joe’s for one thing and one thing only, make sure it’s a visit to their cheese wall. For someone who makes a lot of cheese boards and has what some might qualify as a cheese problem, Trader Joe’s is the solution. Extremely reasonably priced cheeses and a huge selection. My favorites are the Dubliner Cheddar (which you will not find cheaper anywhere, ever), St. Andre, a brie like cheese, the Drunken Goat, Trader Joe’s brand Feta Cheese in Brine, their Goat Gouda, their fresh mozzarella…I could go on and on. It’s a great place to grab cheeses that can get pretty pricey elsewhere like grueyre as they are sold in sealed packages so last for a long time until you have a french onion soup emergency. Also right next to the cheese is a deli meat display. Please skip past all the sad looking pre-sliced turkey and go right for the prosciutto. I like this brand in the picture better then their own Trader’s Joe brand but either way they are both very inexpensive and another great staple to have in your fridge (grilled cheese with prosciutto emergencies are a real thing too). Make sure to hit the nut aisle before the holidays – the prices are out of this world. I buy in bulk and then make my famous spiced nuts as gifts for people all season long. I also make sure to have a bag of roasted and salted cashews on hand for any impromptu happy hour. TJ’s also has a great selection of dried fruit like cranberries, apple chips and crystallized ginger. There is usually one aisle next to produce that has various canned goods, condiments and the like. I am a snob when it comes to oils and vinegars so I usually skip past those. The canned beans and coconut milk are good and cheap but not really any better then what you get at a regular store. What are great are these Yellow and Red Roasted Peppers. Not only do I like that they use two different color peppers (presentation is everything!) but they are nicely charred, and are a great deal. Another terrific pantry staple to turn into crostini or pizza topping. This aisle or perhaps the end of it, is usually where all the seasonal stuff is. When fall hits I head straight to Trader Joe’s and buy all the pumpkin everything. That Pancake and Waffle mix is incredible and I will be posting a recipe next week for a dip to go with their Pumpkin and Cranberry Crisps that would be perfect for Thanksgiving. A lot of the stuff at Trader Joe’s is meant to support a healthy live style, organic, etc etc but they also have some really dangerous treats scattered around the store. My friends Debbie and Toby introduced us to these Dunkers that are just awesome with coffee. Usually they are in the frozen food aisle. Also in the frozen aisle are their incredible self rising croissants. On a recent visit to my dad’s house he opened my eyes to these babies and as soon as I came back I had to get them. They are sold frozen but you have to make sure to plan in advance as they rise over night. Take them out of the packaging and place them on a baking sheet the night before and viola, the next AM they have tripled in size and are ready to bake off. 20 minutes later it’s like you have a French cafe right in your own kitchen. They have plain mini ones, my favorite the chocolate ones and my dad’s favorite the almond ones. 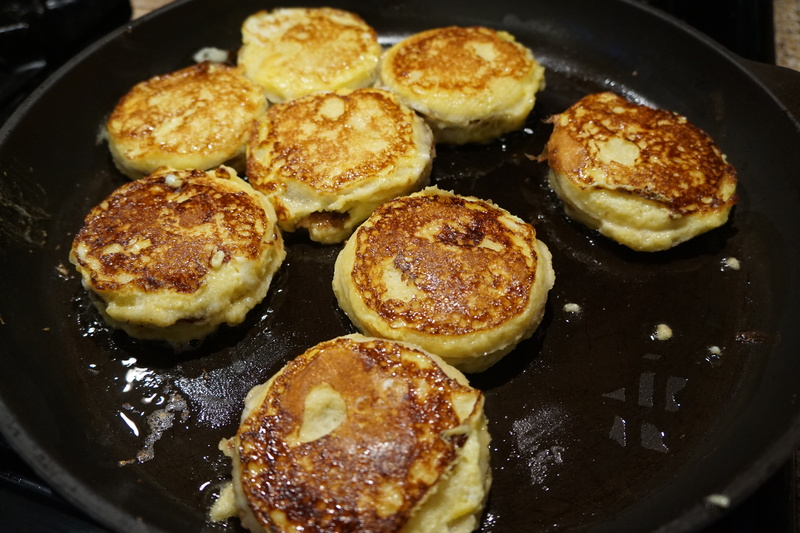 They are the perfect thing to make when you have overnight guests. Unfortunately they didn’t have any of my favorite sweet treat last time I visited – the Trader Joe’s Dark Chocolate Sea Salt Caramels. They usually carry them around Christmas, though this year they also did a pumpkin version for fall. SO good – make sure to stock up this December to last you through the first nasty snow storm. Now that you have all that cheese you are going to need wine to go with it. Again low prices and a pretty diverse selection though you can run into some duds here. The craft beer selection is always solid and usually features whatever is local (in DC is its a good spot to pick up Port City or DC Brau beer). For wine I usually go with the Oyster Bay Sauvignon Blanc or the Rabbit Ridge Allure de Robles but there are also some nice Italian reds and French roses. Avoid the 2 buck chuck and go for those with the “staff pick” signs and you should be good. Yea I know, what won’t this woman put in a taco?? Pretty much nothing but honestly these are incredible, not just because of the flavor but how easy they are. Time consuming sure but the “hands on” time is almost zero. I got the methodology from Cooks Illustrated – if you have never picked up their magazine it’s definitely worth a try. They basically do all the work for you by testing and retesting different ingredients, proportions and cooking methods in a super methodical, almost scientific way. I can find sometimes the flavors a bit lacking, but the techniques they share are always spot on and flavor is easy to enhance with some tweaks. This method is just genius because it cuts out the two most annoying things about slow cooking – browning and chopping. Browning meat is incredibly important to flavor, as the heat carmelizes the sugars in the meat and really develops them. By lifting the short ribs out of the liquid it’s braising in on onion slices these folks have discovered a way to get the browned meat without having to spend the time cooking each side before adding it to the pot with the aromatics. Also by pureeing the sauce you lose the need to chop any of the veggies, meaning all you have to do is slice an onion and then everything else is just tossed in the pot. I did this in a dutch oven but you could easily convert this to a slow cooker (especially in the summer not to heat up the house). I included both so you can do either. This recipe makes a ton so perfect for your next taco party. It can be frozen for up to 6 months so if you don’t eat it right away divide the rest into smaller portions and then you can have pulled short rib tacos on a week night and blow everyone away. Take the short ribs out of the fridge at least 30 minutes before you are going to cook. Pat them dry with paper towels and season well with salt and pepper. Preheat your oven to 325 degrees (if using the dutch oven). Then dump in the beer, vinegar, anchos, tomato paste, garlic, bay leaves, cumin, oregano, clove and cinnamon in a large dutch oven (or slow cooker). Season with salt and pepper again and then nestle in the onion rounds so they form a layer on the bottom of the pot (or slow cooker) that will keep the short ribs from touching the bottom. Depending on the size of your onion it will probably only take one but have a second on hand just in case. Place the short ribs on top and cover. Place in the oven and cook for 3 hours (if using a slow cooker cook on high for 3 hours or on low for 6 hours). The meat, even without browning, should have a nice crust on it. Take out the meat and put it in a bowl. 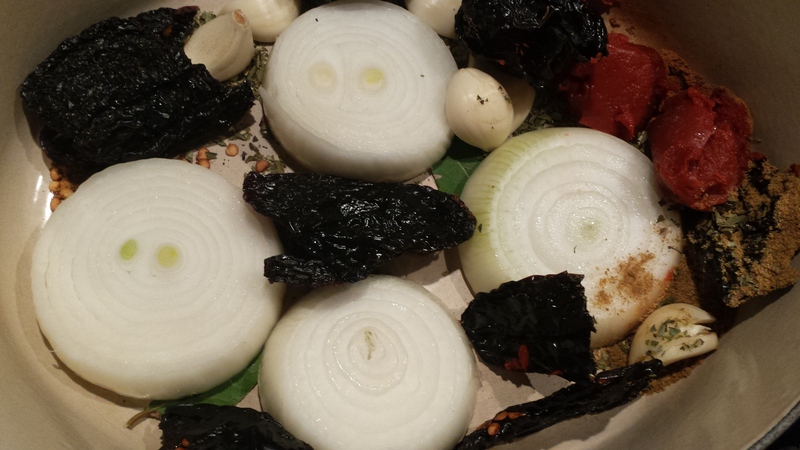 Pull out the bay leaves and then blend the onions and the liquid in a blender or food processor. The original said to trash the onions but why throw away flavor?? At this point you could probably just use the sauce but I like to get as much fat out of it as possible. Easiest way to do this if you have time it to place it in the fridge or freezer until the fat creates a solid layer on top that you can scrape off (that will take a couple of hours). If not just let sit until the fat rises to the top and skim it off. Shred the meat with 2 forks or your fingers and stir it into the sauce. It can be served right away, or stored in the fridge for a couple of days and the freezer for a couple of months. 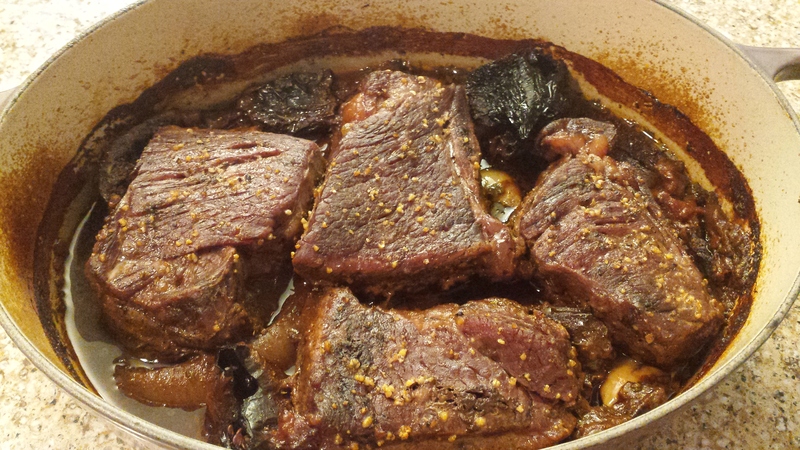 Take the short ribs out of the fridge at least 30 minutes before you are going to cook. Pat them dry with paper towels and season well with salt and pepper. Preheat your oven to 325 degrees (if using the dutch oven). Then dump in the beer, vinegar, anchos, tomato paste, garlic, bay leaves, cumin, oregano, clove and cinnamon in a large dutch oven (or slow cooker). Season with salt and pepper again and then nestle in the onion rounds so they form a layer on the bottom of the pot (or slow cooker). Place the short ribs on top and cover. Place in the oven and cook for 3 hours (if using a slow cooker cook on high for 3 hours or on low for 6 hours). Take out the meat and put it in a bowl. Pull out the bay leaves and then blend the onions and the liquid in a blender or food processor. At this point you could probably just use the sauce but I like to get as much fat out of it as possible. Easiest way to do this if you have time it to place it in the fridge or freezer until the fat creates a solid layer on top that you can scrape off (that will take a couple of hours). If not just let sit until the fat rises to the top and skim it off. Shred the meat with 2 forks or your fingers and stir it into the sauce. It can be served right away, or stored in the fridge for a couple of days and the freezer for a couple of months. Here is the shopping list for this week’s menu calendar dishes which can be found here. July 11th is National Mojito Day – turns out that pretty much everyday of the year has some food or drink attached with it. I am not so sure we need a National Blueberry Muffin Day (which incidentally is also the 11th) but I think any excuse to drink a mojito is a good one. The mojito surged in popularity a decade ago but really has been around forever. Back when they first became popular most bartenders hated making them because they required muddling. Now if you order a cocktail and it doesn’t come with some muddled element, a homemade tonic, slapped basil and a nitrous foam you may as well just order a Bud heavy! I still like the original version as it’s refreshing and perfect for the summer but years ago we began experimenting by using tequila instead of the traditional rum. The sharpness of the tequila is really great with the mint and keeps it from getting too sweet. I have also switched out the usual sugar or simple syrup for agave nectar since tequila is made from agave, they are natural friends. There is no rule that says you have to wait untill tomorrow and its official day to have a mojito though – it is Fiesta Friday after all. In the bottom of a cocktail shaker muddle (i.e. crush with a muddler or a wooden spoon) the mint leaves, lime quarters and agave. Normally I don’t like dirtying up another vessel and would just say muddle it directly in the glass but I have seen way too many break that way. If you have a really sturdy one go ahead, otherwise use a shaker. Pour in the tequila, shake it up and pour the contents into a glass (don’t strain it like you would with most drinks, it’s nice to have the crushed lime and mint in the drink to keep giving off flavor). Add ice and club soda to cover, stir, and a sprig of mint if you are feeling fancy. In the bottom of a cocktail shaker muddle (i.e. crush with a muddler or a wooden spoon) the mint leaves, lime quarters and agave. Pour in the tequila, shake it up and dump the contents into a glass (don’t strain it like you would with most drinks, it’s nice to have the crushed lime and mint in the drink to keep giving off flavor). Add ice and club soda to cover, stir, and a sprig of mint if you are feeling fancy. Items are tagged with the day of the week they are used so if you don’t want to cook that day just scratch it off. I know I have mentioned our Fiesta Friday tradition. I am not sure exactly when it got started but it did come about pretty organically. I realized I was doing tacos and margaritas on Fridays a lot because it seemed like such a great way to cap off the week. Of course then I made the mistake of naming it and making it a thing so that my husband, friends and colleagues were asking me every Friday what was on the menu for Fiesta Friday. 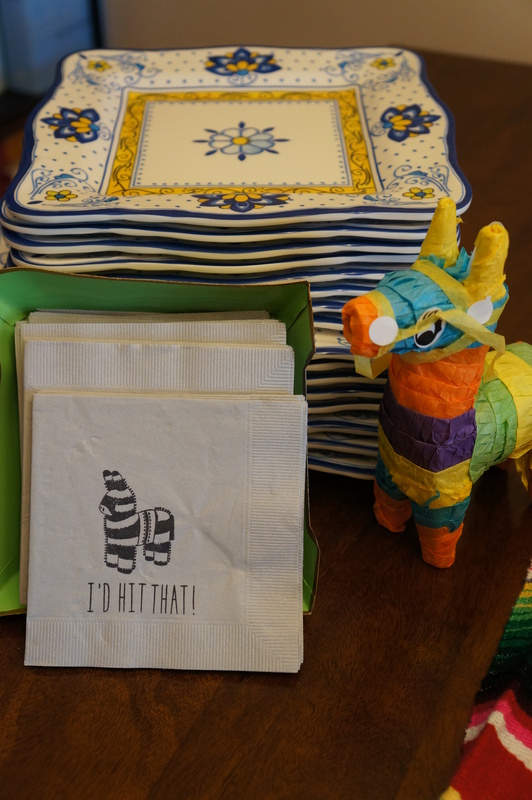 The pressure was on and while I like the idea of a fiesta to unwind after a long week, cooking a full meal can also be daunting after a week of work. I knew enchiladas would be the answer to this problem. Somewhat time-consuming to make but they freeze great and can be cooked right from the freezer so basically all you have to do when you get home on Friday is turn on the oven and pour the margs. I got the cooking method for this one from Cooking Light magazine but the rest is a creation of my own. Cooking Light often has great ideas on how to freeze things or do them in advance but I find a lot of their recipes almost too dumbed down. That’s why its good to scavenge inspiration from a variety of sources – meals eaten in restaurants, magazines, friend’s cooking etc. This recipe is a chameleon – make it with shredded pork instead of chicken, tomatillo sauce instead of enchilada sauce, swap the corn for beans – you get it. I made my own enchilada sauce but guess what? Totally not worth it – turns out this is one of those times that the store-bought is just as good, if not better. I would budget 2 enchiladas per person but if you were super hungry then someone could easily polish off 3. Preheat the oven to 350 degrees (do this even if you are freezing them as you need to par bake before freezing). Heat the oil in a large skillet over medium heat. Add the onions and garlic and cook for 3 to 4 minutes. Add the chipotles, green chilis, tomatoes and corn. Turn up the heat to medium high and cook for approximately 8 minutes until everything has combined and some of the liquid from the chilis and tomatoes has cooked off. Season with salt and pepper and stir in the chicken and scallions. Remove from the heat. Spray the pan or pans with cooking spray and put the enchilada sauce in a shallow bowl. Microwave the tortillas for 20 seconds (do 6 at a time so they stay warm). Microwaving the tortillas makes them more pliable and easier to stuff. Spread several tablespoons of enchilada sauce on the bottom of the pan/pans to cover with a thin layer. 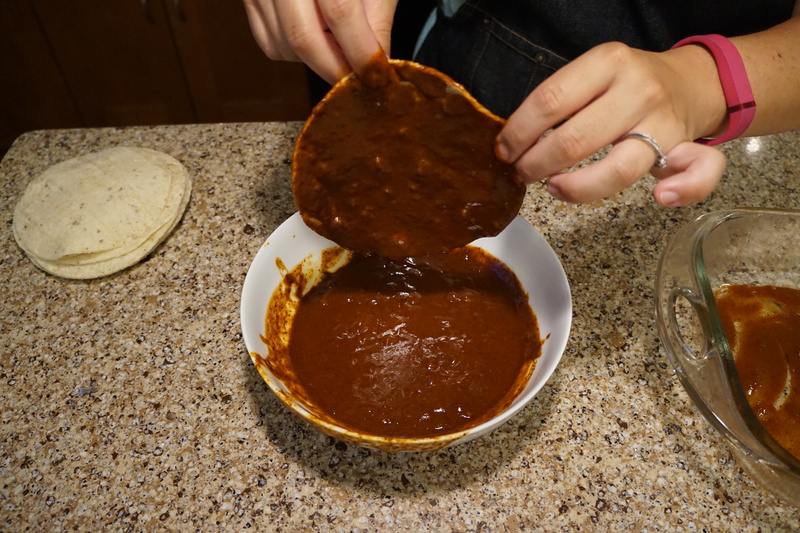 Dip a tortilla into the enchilada sauce and shake off the excess. This is a messy job so just get into it. 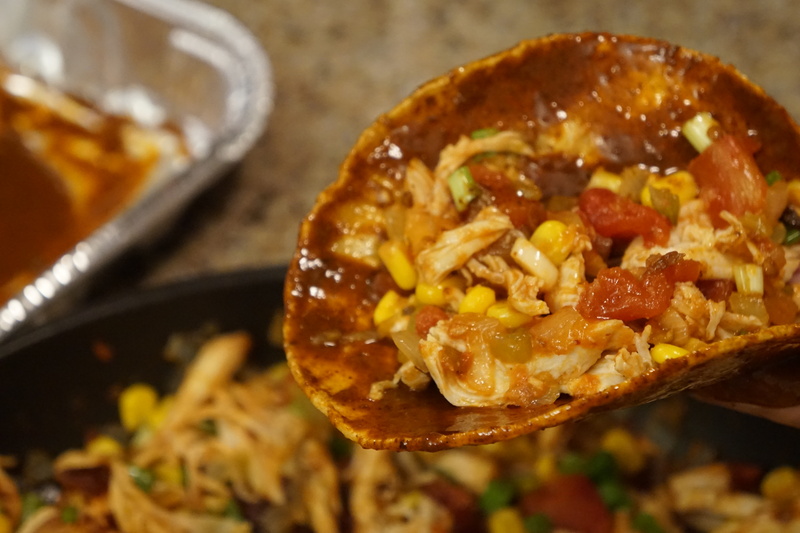 Stuff the tortilla with several tablespoons of the chicken mix and fold over the two sides. If you have over stuffed the tortilla theends won’t meet, so then just scoop out a little and keep moving. Put into the pan with the seam side on the bottom. Keep going with the rest of the tortillas – if you are making two pans, 6 tortillas will fit in each. Don’t worry if you have to squish them in to fit, it’s actually better if they are tightly in the pan. Microwave the second batch of tortillas and repeat until there are no more tortillas or stuffing. 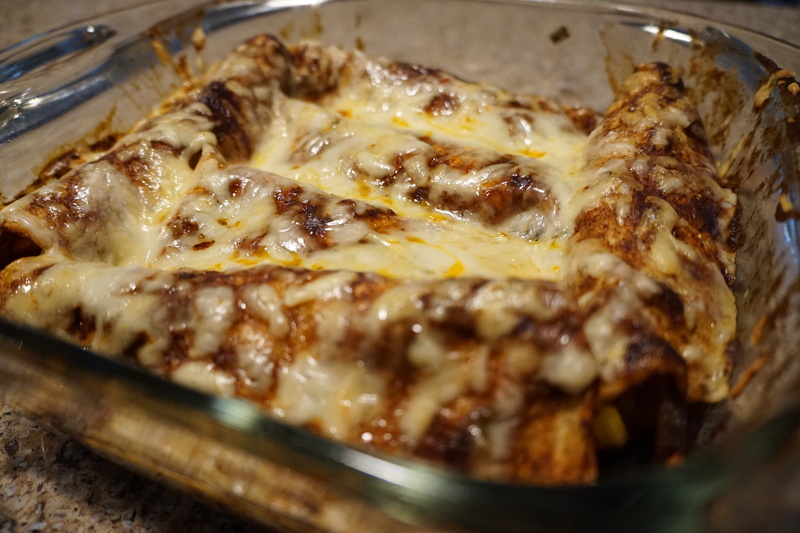 Spoon over any remaining enchilada sauce and then cover with cheese. If eating now: bake at 350 degrees for 25 minutes. If freezing: bake for 15 minutes then remove from the oven and allow to cool. Once room temperature, tightly cover with foil and freeze. Then to reheat bake it straight from the freezer at 400 degrees for 45 minutes. I baked one to eat immediately and one to freeze which was perfect. Preheat the oven to 350 degrees. Heat the oil in a large skillet over medium heat. Add the onions and garlic and cook for 3 to 4 minutes. Add the chipotles, green chilis, tomatoes and corn. Turn up the heat to medium high and cook for approximately 8 minutes until everything has combined and some of the liquid from the chilis and tomatoes has cooked off. 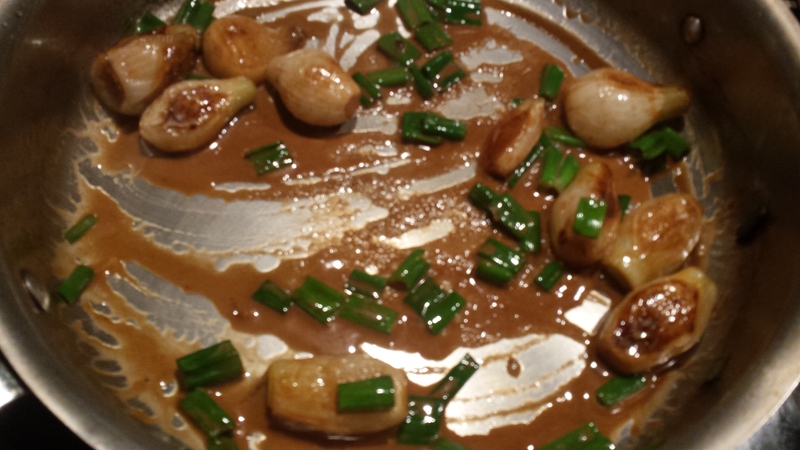 Season with salt and pepper and stir in the chicken and scallions. Remove from the heat. Spray the pan or pans with cooking spray and put the enchilada sauce in a shallow bowl. Microwave the tortillas for 20 seconds (do 6 at a time so they stay warm). Spread several tablespoons of enchilada sauce on the bottom of the pan/pans to cover with a thin layer. 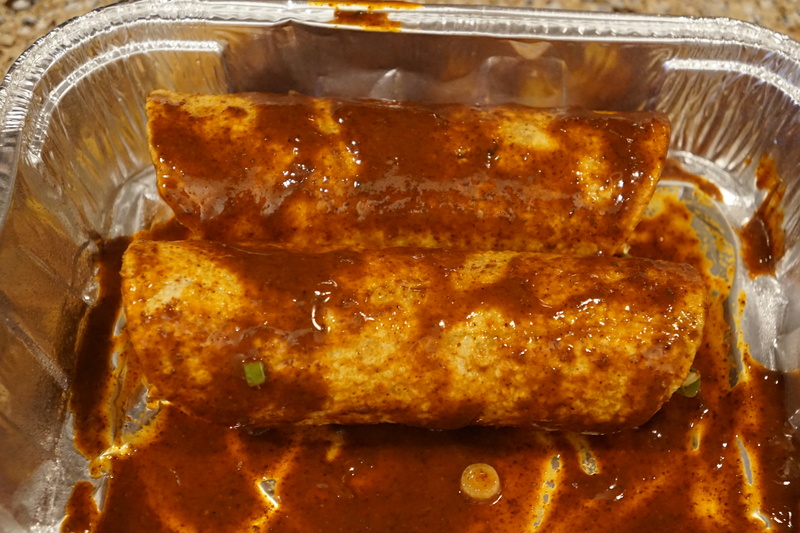 Dip a tortilla into the enchilada sauce and shake off the excess. 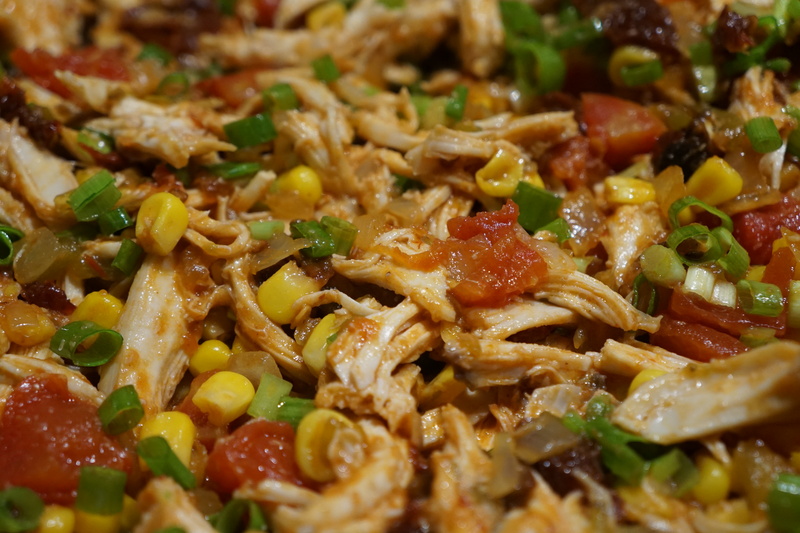 Stuff the tortilla with several tablespoons of the chicken mix and fold over the two sides. Put into the pan with the seam side on the bottom. Keep going with the rest of the tortillas – if you are making two pans 6 tortillas will fit in each. Microwave the second batch of tortillas and repeat until there are no more tortillas or stuffing. Spoon over any remaining enchilada sauce and then cover with cheese. If eating now: bake at 350 degrees for 25 minutes. If freezing: bake for 15 minutes then remove from the oven and allow to cool. Once room temperature, tightly cover with foil and freeze. Then to reheat bake it straight from the freezer at 400 degrees for 45 minutes. I am not sure when brunch became synonymous with Mother’s Day but every year I get an avalanche of special menus or deals from restaurants trying to get me to over pay for eggs to celebrate Mom. Do dads not like bubbly drinks and high calorie food? I say celebrate Father’s Day this Sunday with a brunch in his honor and what better way to do that then with Nutella stuffed french toast?? My dad is a Nutella fan – in fact we had a hamster when I was a kid that I named after Nutella (RIP Nutty). When I saw this recipe in House Beautiful of all places, I knew it was a must make item. Usually I am not a huge french toast person, as I think the syrup ends up competing with the doughy toast so this is the perfect solution as it requires no syrup at all. The recipe comes from John Besh, an unbelievable chef with a small restaurant empire down in New Orleans. Last time Patrick and I were in NOLA we managed to eat in two of his restaurants in one day and his jalapeno grits are something I still dream about. He says you can stuff these with peanut butter or jam if you prefer, but I think the Nutella is really perfect. When you punch out the toast rounds don’t worry if they don’t look perfect. As you can see mine weren’t but once they get a dunk in the egg mixture and fried up they look just fine. Also sometimes the sandwich got a little stuck in the glass, just poke it up from the bottom and it will come lose. I decreased the egg mixture and nixed the oj as I didn’t feel it added anything and I ended up throwing a ton of egg away. If your bread really soaks up a ton then you can just beat in another egg and some milk. One note – french toast is a pretty tough thing to make for a crowd but you can at least make some of these elements in advance so you don’t spend all your time with your guests in the kitchen. I made the sandwiches and the egg mixture hours before and just dunked and fried them when ready which takes about 5 minutes. You definitely want to serve them right away while the Nutella is nice and melty. Happy Fathers Day to my dad and all the dads! 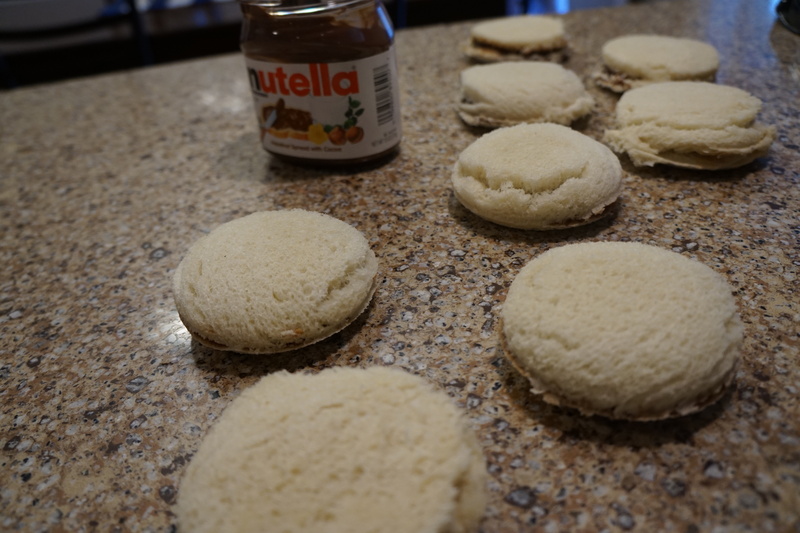 Lay out all 16 slices of bread and then spread approximately 1 tablespoon of Nutella in the middle of 8 of the slices. Top those slices with the non Nutella slices to create a sandwich. 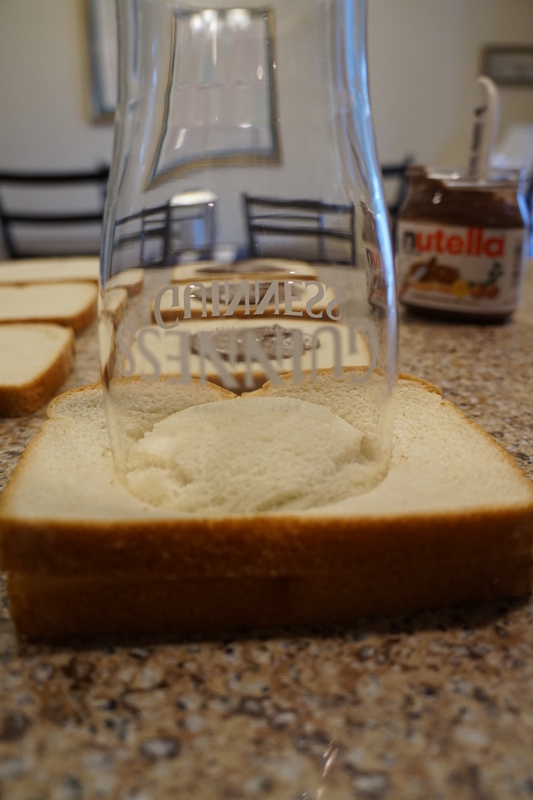 Using a pint glass, cut a round sandwich out from the middle, pulling the excess crusts off before lifting the glass. This step can be done ahead several hours or the day before (if so store sandwiches in a tupperware). Whisk together eggs, milk, sugar, butter, vanilla, and salt in a large shallow bowl. 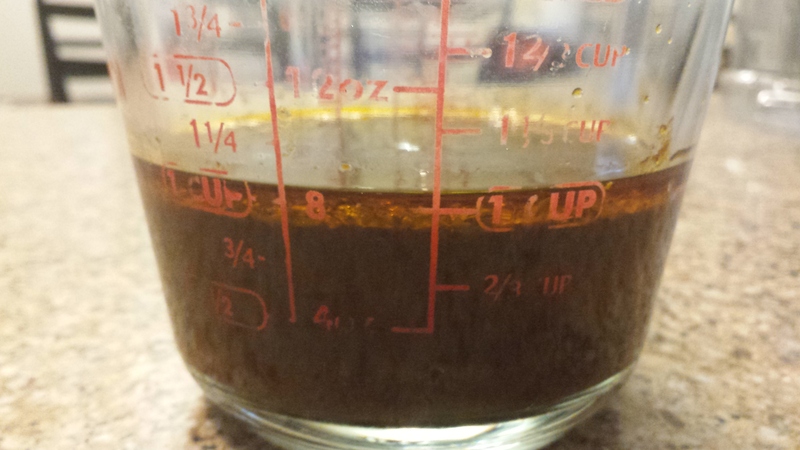 Again, this can be done in advance just let it come up to roomish temperature before dipping. Heat 2 tablespoons of canola oil in a large skillet over medium high heat. Depending on the size of your skillet you may be able to do all the sandwiches at once (I did) if not fry them in batches of 4. Dunk the sandwiches untill they are fully coated in the egg mixture. Add sandwiches to the pan and cook until browned on both sides – about 2 to 3 minutes per side. 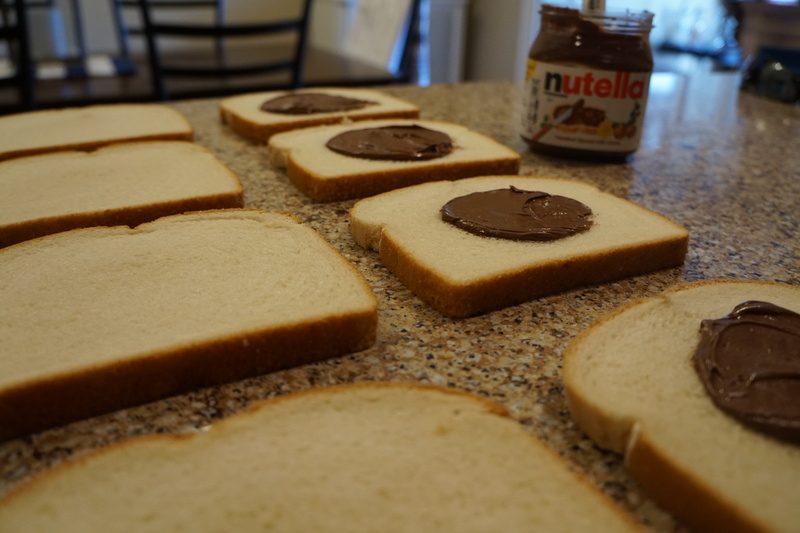 Lay out all 16 slices of bread and then spread approximately 1 tablespoon of Nutella in the middle of 8 of the slices. Top those slices with the non Nutella slices to create a sandwich. Using a pint glass, cut a round sandwich out from the middle, pulling the excess crusts off before lifting the glass. This step can be done ahead several hours or the day before (if so store sandwiches in a tupperware). Whisk together eggs, milk, sugar, butter, vanilla, and salt in a large shallow bowl. Again, this can be done in advance just let it come up to roomish temperature before dipping. Heat 2 tablespoons of canola oil in a large skillet over medium high heat. Depending on the size of your skillet you may be able to do all the sandwiches at once (I did) if not fry them in batches of 4. Dunk the sandwiches untill they are fully coated in the egg mixture. Add sandwiches to the pan and cook until browned on both sides – about 2 to 3 minutes per side. 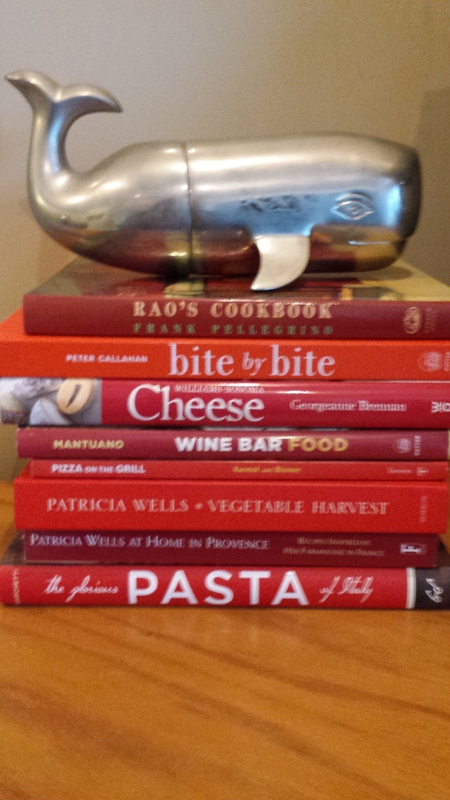 I have a lot of cookbooks – a lot of cookbooks. Some are well used, pages curled with splatters and stains, the cover taken off years ago. Some remain pristine on the shelf because of overly complicated recipes or a lack of inspiration. But when Rick Bayless’s new cookbook arrived in the mail the other day I quickly ripped though it and declared More Mexican Everyday a game changer. I immediately saw how I could incorporate basics from the book into my cooking routine, had a million flags on recipes I wanted to try right away and was even more excited that I am going to get to eat at one of Mr. Bayless’s restaurants soon. What I love most about this book is that it focuses on traditional mexican recipes but in a very approachable way with alternative ingredients suggested and swaps for more seasonal ingredients so you can use the same base recipe throughout the year. It’s exactly the kind of instruction and support that I had hoped to bring with A Capitol Contessa. Another exciting thing about this book is the focus on vegetable preparations. Every fiesta friday that rolls around I struggle to come up with vegetable sides and instead often rely on the carb heavy rice and beans. This book explores recipes with traditional mexican vegetables like chayote and tomatillos, as well as more innovative approaches to veggies like eggplant and artichokes. 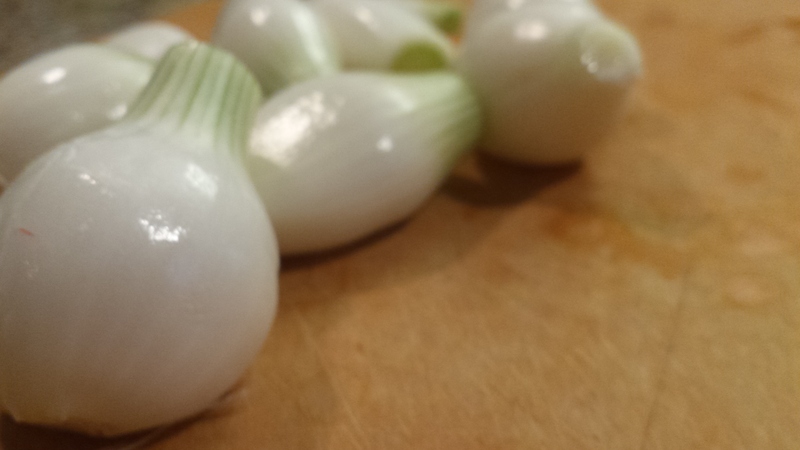 These knob onions (as he describes them) are super quick and easy and could easily be mistaken for a standard creamed onion if not for the subtle flavor differences brough by charring the onions, the addition of aged mexican cheese and the chipoltes. 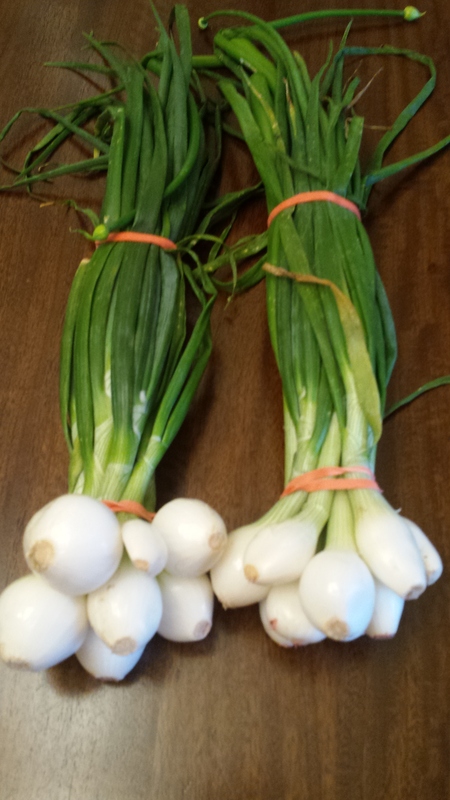 I think this would be a really fun change up on your thanksgiving table instead of the standard creamed onions but they are really terrific now when spring onions are super sweet and able to be found locally. It’s totally up to you if you want to add heat to this – I think its terrific either way and not all Mexican food needs chili to power it. Preheat your oven to 425 degrees. To prep the onions you want to cut off the green parts right where it meets the white part. Clean the white part, peeling off any brown or sad looking bits. For the greens take about a 1/4 of the best looking ones and chop. In a large skillet heat the olive oil over medium high heat. Toss in the white onion parts and cook for approximately 5 minutes, tossing them around occasionally, until they are starting to brown. Throw the skillet into the oven and cook for 15 minutes, tossing the pan every 5 minutes or so. CAREFULLY (yes I did grab the pan and forget it was in the oven and burned my hand – thanks for asking) take the pan out of the oven and toss in the greens as well as the creme fraiche and chili if you choose to use it. Salt and pepper the onions then toss with the grated cheese. Preheat your oven to 425 degrees. To prep the onions you want to cut off the green parts right where it meets the white part. Clean the white part, peeling off any brown or sad looking bits. For the greens take about a 1/4 of the best looking ones and chop. In a large skillet heat the olive oil over medium high heat. Toss in the white onion parts and cook for approximately 5 minutes, tossing them around occasionally, until they are starting to brown. Throw the skillet into the oven and cook for 15 minutes, tossing the pan every 5 minutes or so. CAREFULLY take the pan out of the oven and toss in the greens as well as the creme fraiche and chili if you choose to use it. Salt and pepper the onions then toss with the grated cheese. For this week’s shopping list and menus I am trying to use more ingredients multiple ways so you can get a lot of use out of them. I am hoping the more I do this the more natural it will become but bear with me! Please send anything you would like to see on the menu and I will make sure to incorperate them. I cook almost every single day. To people who know me well that doesn’t come as much of a surprise but anytime I meet someone new they marvel at the thought. How do you have the time? Where do you get the energy? 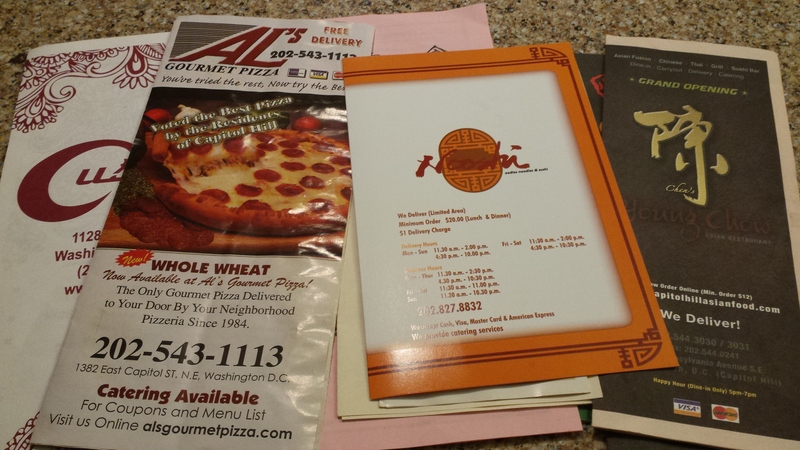 Don’t you ever just want to call takeout? The answer to that last one is yes – for sure. Everyone has days where the thought of putting something in a pan seems impossible. However, I have to say even on rough work days, or at the end of a busy weekend, I am usually happy, even eager to cook. Sure I have to check my blackberry while cooking but trust me I have mastered simultaneously stirring and typing. Stop looking at cooking as a chore and start thinking of it as a creative outlet and a way to decompress. The key to changing that mindset is setting yourself up for success by menu planning. When building the week’s menu I go through recipes I want to try and think about what we already have in the fridge that I can incorporate. We have some standbys that show up often but generally I like to make something new at least a couple of times a week (because I am a masochist). If you are just trying to get in the groove of weeknight cooking go with tried and true meals you feel confident making. I also put thought into the week as a whole. Sure we might have chicken multiple times a week but no one needs to have it two days in a row so I stagger the proteins. I also mix it up when it comes to cuisine – if we are having beef tacos one night I wont make turkey chili the next day. Ok so now you have a couple of meals planned – next you have to make sure to have everything on hand. I loathe grocery shopping. Part of it has to do with the quality of grocery stores in Washington (seriously Safeway you are out of milk??) but it’s also a total bummer after a long day of work having to wield a huge cart down ridiculously narrow aisles, just to get home and have to put it all away and then start cooking. That is why I try to shop once a week, usually on the weekend, and make it last. When considering produce, use the most perishable items early in the week and leave the heartier stuff towards the end of the week (or frozen) to ensure that you have fresh veggies each night. Also buying in bulk is your friend, especially when it comes to meat. We head to Costco, buy meat for a family of 18 and then vacuum seal them in more reasonable portions to be defrosted for weeknight meals. 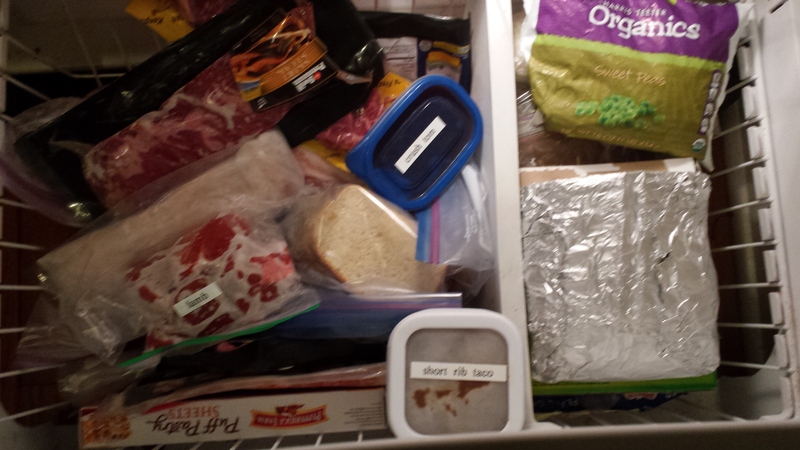 My freezer (ok freezers, we have 2) are stuffed to the gills but it makes shopping and cooking much easier (also means you are ready for last minute dinner parties and the apocalypse). I started to put our dinner menu on a shared google calendar so I could keep track and so Patrick could see what he will be eating each night. When I decided to start the blog my friends Dave and Ashley lobbied in the best DC way to get our menu calendar on the blog – so here it is. Every Friday I will update the menu calendar page with some weeknight meals for the following week and post a shopping list for the ingredients you will need on the blog. Some assumptions will be made (you all have salt, pepper and olive oil right??) but it should set you up pretty well to not have to think at all and still put several healthy, homemade dinners on the table. Once I have a good inventory of recipes on the blog most of the dinners will circle you back to a previous post but for now most of them will take you to other sites. Even if you don’t want to make the recipes provided it will give you a sense of what types of things really can work on a weeknight and some ideas of sides etc to round out a full meal. Let me know how you like it and if it’s getting you cooking more during the week. Its been a month of A Capitol Contessa and over 1,600 visitors – cannot thank you all enough for reading and following. Please send the blog along to friends and family – the more readers I get the more good ideas for posts I have! And don’t worry – I havent forgotten that its Fiesta Friday. I will not leave you high and dry without some inspiration. We tried the Mi Vida from Food and Wine several weeks ago and were very happy indeed. 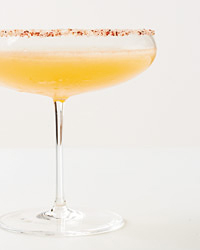 The smokiness of the mezcal goes really nicely with the grapefruit and the pink peppercorn and sugar rim takes it to the next level. If you don’t have pink peppercorns just do sugar – black pepper wouldnt work as well and wouldn’t be as cute! I also cheated and used Tropicana grapefruit juice instead of fresh and it was still delicious. Happy weekend!